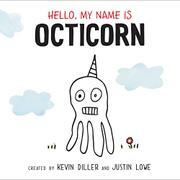 The offspring of an octopus mom and a unicorn dad, Octicorn really needs a friend. With a grim expression, line-drawn body, and mismatched eyes, Octi is still a cute little critter with remarkable self-awareness. Octi is sad to be the only one without an invitation to a cupcake party—and grasps how unusual it is to be one-of-a-kind as a species. Octi speculates about how Mom and Dad may have met ("maybe a personal ad") and reveals the perils and bonuses of having four legs and a sharp protrusion from the head. The playground merry-go-round is a challenge, but juggling and roasting marshmallows are a snap. What Octi doesn't do, unfortunately, is narrate a story that goes beyond the novelty of a book-length character introduction. By the book's end, all readers know about Octi is that it's exceptionally lonely, and not in an endearing way that invites more interest. Rather, Octi seems desperate in a way that makes the concluding invitation for hugs and friendship a call for pity instead of excitement. The doodle-simple illustrations, which seem to have been enhanced with some splashes of color in the book’s transition from self-published Kickstarter project to major publisher release, only add to the feeling that this was a thin idea unable to transcend its one-joke premise.